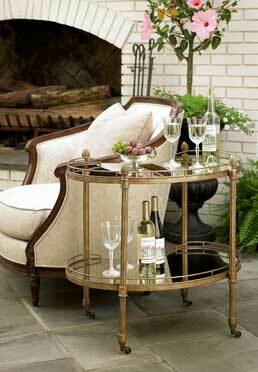 This delightful Beverage Cart is both functional and stylish, making it a must-have. While it embodies an antiqued, traditional look, it also exudes a very modern, elegant feel and works great in almost any setting. The beautiful acorn finials were inspired by the Breakfast Room ceiling in Biltmore House. The ornate plasterwork ceiling is highlighted with a gold-tinted glaze and features heavy pendants that terminate in tiny acorns--one of the symbols in the Vanderbilt family crest.